SafeAndCertified.com has everything setup for you to ensure your compliance is as fast and easy as possible. Individuals who Require Personal WHMIS - we can have you registered and trained with your WHMIS Certificate in hand in 60-75 minutes! Employers - we can help track progress and supply you with automated reminders, we have the ability to keep you 100% updated with any changing rules and regulations. Our online modules are user-friendly, easy to understand, and can be completed in 60-75 minutes. Testing is provided at the end of your training, with the opportunity to immediately correct any answers and re-test to assure your staff has retained the correct knowledge. Certificates can be printed out immediately and, just like that, your WHMIS compliance is achieved! Effective December 1, 2018, Canadian workplaces are officially required to have transitioned from the original WHMIS to the NEW Canadian - WHMIS / GHS Classification and Labeling of Chemicals (GHS). Canadian employers are required to make this new information available to employees AND to provide WHMIS training on the new GHS system even if workers were previously trained on the old system. WHAT IS WHMIS AND WHY IS IT IMPORTANT. In 2015 a new version of WHMIS was released and a staggered implementation was used to encourage all workplaces to communicate the new system. The deadline for the full application of the 2015 WHMIS is Dec. 1, 2018. This new system brings Canada in line with the Globally Harmonized System of Classification and Labeling of Chemicals (GHS) with some fery important customizations for Canada's unique industries and workplace requirements. Link to page, What is GHS? According to the government of Canada, the GHS is an "internationally consistent approach to classifying chemicals and communicating hazard information through labels and safety data sheets," (www.Canada.ca). It is the most advanced hazardous materials practices around the world and the standard internationally agreed-upon and managed by the United Nations. When countries trading with Canada, such as the United States and more, align themselves with one set of regulations, safety standards and work conditions improve to the benefit of all. Training employees may require knowing exactly what hazardous products are present in the workplace, where they are stored, and how they are used, handled or disposed of. Employees may need to know how to identify hazards and how to keep records on hazardous materials using safety data sheets. Workplaces may need to provide clear procedures for safety at all times and in emergencies. 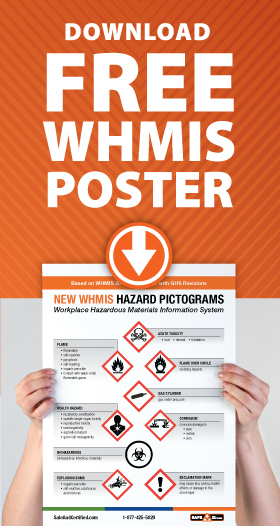 Get our FREE WHMIS Pictogram Poster! Measuring the program and ensuring it is always up to date is also important as the amount of health and safety regulation and enforcement is steadily increasing. Employers may choose to review their WHMIS training program annually, or if workplace conditions or products change. Does a WHMIS Certificate Expire?